You’ll be expected to design and execute a whole-group monitoring project as part of your experience. The project usually takes place in the field on SCUBA and is dependent on whole group coordination. We believe that the best research projects contribute to local conservation efforts. Our projects are designed in conjunction with local conservation organizations, universities, or NGOs and are designed to meaningfully address a pressing problem facing the sea. Young people who have come on an Ocean Matters adventure have collected data on coral vs. algal diversity on two coral reefs facing differing dive pressure in Grand Cayman for the Department of the Environment. We’ve GPS positioned and size classed understudied seahorse populations in Oahu, Hawaii for the Hawaii Institute of Marine Biology. We’ve eradicated invasive lion fish and collected data on fish populations, as well as done underwater trash cleanups in Utila, Honduras. • Young people’s research has been written about in Caymanian National news. 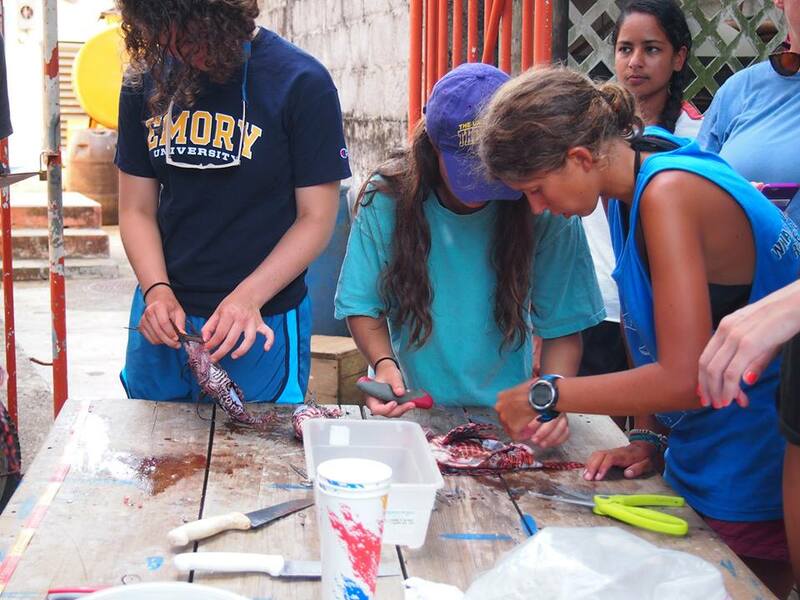 • We’ve contributed to an Oxford University study on the diet of invasive lionfish in the Caribbean. • One of our students, Blakely Kay, won semi-finalist status (1996) with her research paper from the Grand Cayman Coral Reef Ecology program in the prestigious Intel Science Talent Search Competition (formerly known as the Westinghouse Science Talent Search). For more information, see Intel Science Talent Search. July 21-31, 2017, we will be in Oahu, Hawaii at the Hawaii Institute of Marine Biology of the University of Hawaii for our Pacific Program.